I inherited a cast iron skillet. Except when I say that I inherited it, I really mean that the previous tenants of my apartment left it here and I found it and now it’s mine. Because finder’s keepers. I would feel more guilty about having technically stolen this skillet if it weren’t so dang heavy, you know? I mean, the move-outers clearly left it here. No room/strength to lug it out of the place, I guess. Plus it was all cobwebbed and rusty, which is no way to treat a skillet. I had to rescue it. At any rate, I use it now and imagine that it was once my great great grandmother’s who used it to make blintzes and apple cake and dutch babies, and that’s that. 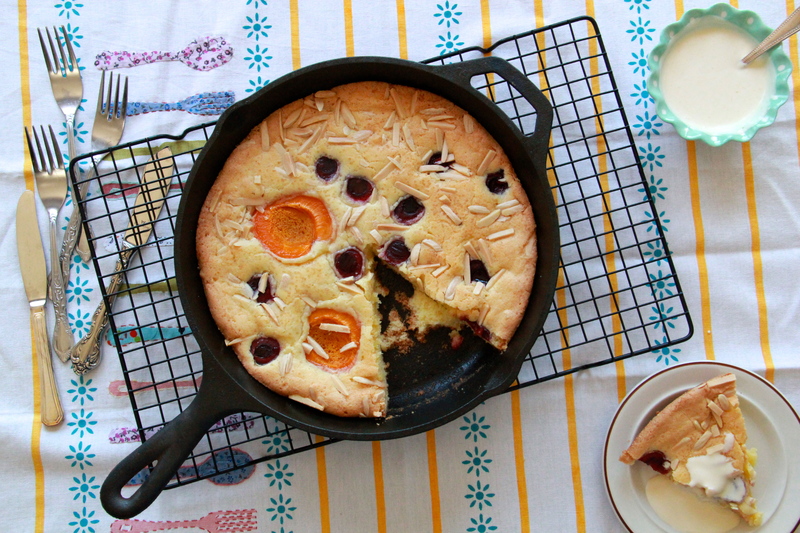 Thievery and nostalgia aside, let’s talk about skillet cake. “Visiting cake,” as the wonderful Dorie Greenspan calls this one. Isn’t the name kind of perfect? Cake and visits should go hand in hand, I think. Anyway, I’m not entirely sure what makes this cake Swedish, but we are all children of the world and this cake is good so let’s just eat it. It’s kind of magic, the way you need dirty only one bowl and one whisk and maybe a spatula to bring this cake together. The process is quick and easy and entirely handmade with love. The resulting cake is dense and buttery, crisp and cookie-like on the outside and soft and tender within. The whole thing rich with the scent of butter and almonds. The ripe summer fruits on top are just sweet and juicy bonuses. 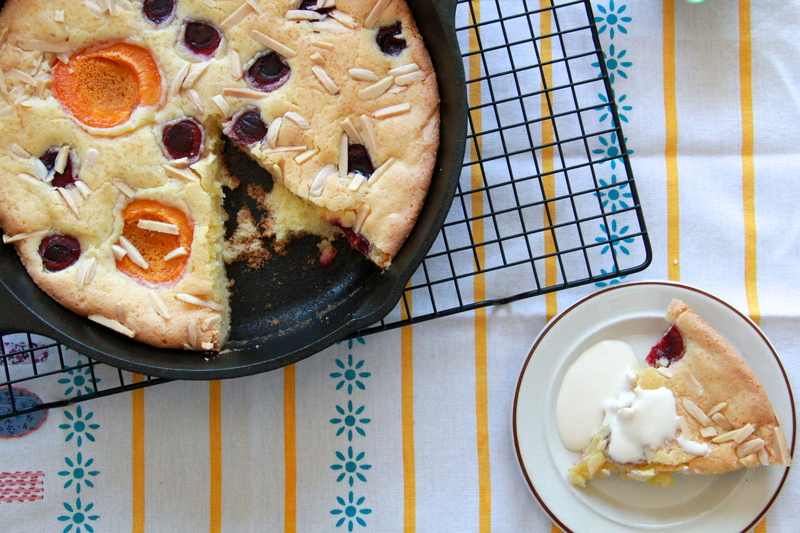 It’s a wholly satisfying specimen of skillet cake. Thank you (again), Dorie. The cake doesn’t really need it, but I found that some lightly sweetened creme fraiche served alongside this beauty is nice for a bit of cooling sourness – the flavor pairs nicely with the warm, sweet cake. Heat the oven to 350 degrees F. Butter a 9- or 10-inch cast iron skillet (if you don’t have an oven-proof skillet, a 9-inch round cake or even pie pan works, too). In a medium bowl, use your fingers to mix and smash together the sugar and lemon zest, thoroughly blending the zest and its fragrant oils into the white sugar. Whisk in the eggs, one at a time, until smooth. Whisk in the salt and the extracts. Switch to a rubber spatula and stir in the flour. Lastly, fold in the melted butter until the thick and shiny dough comes together. Scrape the batter into the skillet and smooth out the top with the spatula. 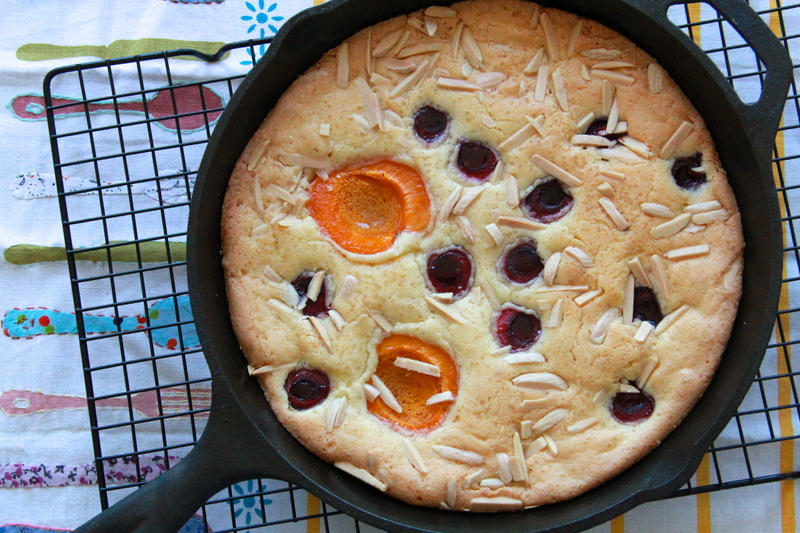 Nestle the halved apricots and cherries in the batter randomly, cut-side up, then sprinkle the slivered almonds around the fruit, and finish it all off with a sprinkling of turbinado sugar. If you’re using a cake or pie dish, place it on top of a baking sheet (no need for this step if using a skillet). Bake the cake for 25-30 minutes, or until it’s golden brown all over and slightly crispy at the edges — the inside will remain moist. Remove the cake from the oven and allow it to cool for 5 minutes before running a thin knife around the sides of the cake to loosen it. To make creme fraiche sauce for serving, mix together the cool creme fraiche and brown sugar until smooth and incorporated. Slice up the snacking cake and serve warm or fully cooled, drizzled with a spoonful of sweetened creme fraiche. is this a skillet cookie? PRETTY MUCH. I mean, in that the pan is very, very, scalding hot. May just have to try this for our family dinner Sunday. 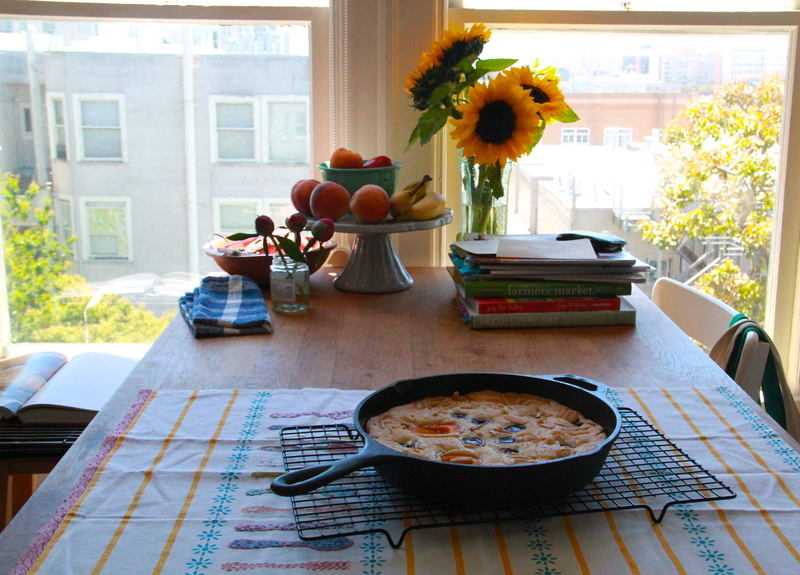 I think – given that it is made in a skillet – I can call this breakfast. Also, the previous tenant *knew* that you were meant to be a great chef – you have graciously accepted their housewarming gift. Yes! I like your theories. The very best cast iron skillets are inherited, whether from your family or from the thrift store (if you’re extremely lucky). The older they are, the better. Don’t get a complex about finding one. They’re like cats – they tend to find their way to a home that loves them. In the 1950’s, my mother had a “chicken fryer” (14″ wide with 3 1/2″ sides) that she used every day and it looked it. Somehow, the funkier and crustier they are on the outside, the better they are on the inside. When I use my beloved CIFPs, I wipe any grease out with a paper towel (so it doesn’t go down my kitchen drain), throw in a big pinch of table salt (no water!) and scour around lightly with another paper towel, rinse with REALLY hot water and set it on the burner at medium for a couple minutes. They gotta be DRY before you put them in a cupboard. Or just leave it on the stove, you’ll use it again that day. One note, be very cautious about cooking anything acidic in them, like spaghetti sauce, because the acid will start removing the ancient ‘seasoning’ patina you worked so hard to get. And then they start to stick, whether frying pan or dutch oven. And trust me, almost everything I know is from the school of hard knocks. I’m older than dirt and have made almost every mistake in the book. But generally only once…. About “seasoning a pan”. I had to look this up, because I couldn’t make sense of how cooked-on grease wouldn’t get rancid. It turns out that pretty much any cooking grease, fat, oil, etc., when heated above the smoking point will “polymerize”, a change in chemical state, to form a slick, food-grade, non-stick coating on the pan. Yay! We’ve all seen it, the polymerization of oils. It’s what’s on the bottom of your oven after you get done cooking Thanksgiving dinner! THAT you ought to remove, but not the patina on your cast iron.